Call of Duty: Mobile is a free-to-play Call of Duty game releasing for iOS and Android devices later this year around the globe, after previously seeing a limited release to Asia in 2018. Developed in collaboration with Activision and Tencent, the mobile game is an all-encompassing mash-up of Call of Duty history, featuring fan favourite maps in both traditional multiplayer and the series' famed PvE zombies mode. Tencent is also adding Call of Duty: Black Ops 4's battle royale mode, Blackout, to the game as part of its global release, alongside even "more modes of play to be announced soon." You can watch the trailer for Call of Duty: Mobile below, which shows off its impressive graphics and gameplay in action. 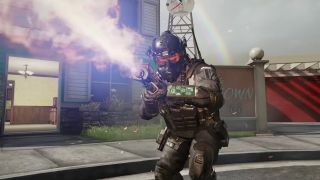 Call of Duty: Mobile is already open for pre-registration on its official website, which will give players access to the game's upcoming public beta in Summer, alongside regular updates and chances to win in-game rewards. This Western release is undoubtedly Activision's way of jumping on the battle royale mobile bandwagon while its still hot, as the likes of Fortnite and PlayerUnknown's Battlegrounds have both seen huge growths in their playerbase by opening their games up to the mobile scene. Call of Duty: Mobile doesn't yet have a specific release date, but you can presumably expect to see a launch day sometime following its public beta in the Summer. Black Ops 4 is just one of many games like PUBG to try out when Bluehole's servers go offline. See which others might be worth your time and money!